laura doodles: Back to Blogging - Illustration Friday "Time"
Hey everyone!! If you haven't noticed, I have really neglected my blog for the past couple months. Art will ALWAYS remain one of my biggest passions. These past few months have brought a whirlwind of change into my life. Here and there I've created some hand rendered pieces I'm pretty proud of but I've really missed creating digital pieces and sharing them online. I made the illustration for an "Illustration Friday," theme from a few weeks back. The word chosen was "Time." 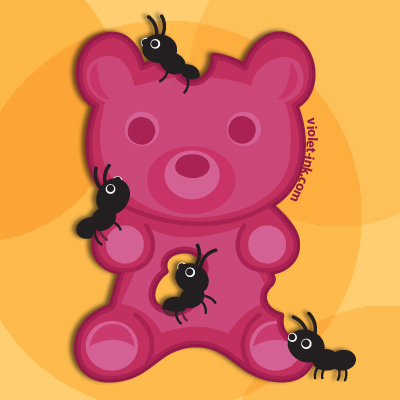 A pink gummy bear being consumed by ants. Ants are extremely clever creatures. If you leave any form of food out they will find it and they will eat it no matter how long it takes them. And unfortunately for this little gummy guy time was not on his side!! Hope everyone has a great week and be sure to stay tuned for more illustrations!